In Growing up/An Aristotelian in a Platonic world the next painting in my Mediation’s on perspective series, I chose to take that stage of growth when one matures into an independents of thought, and starts to question what had been taken for granted. 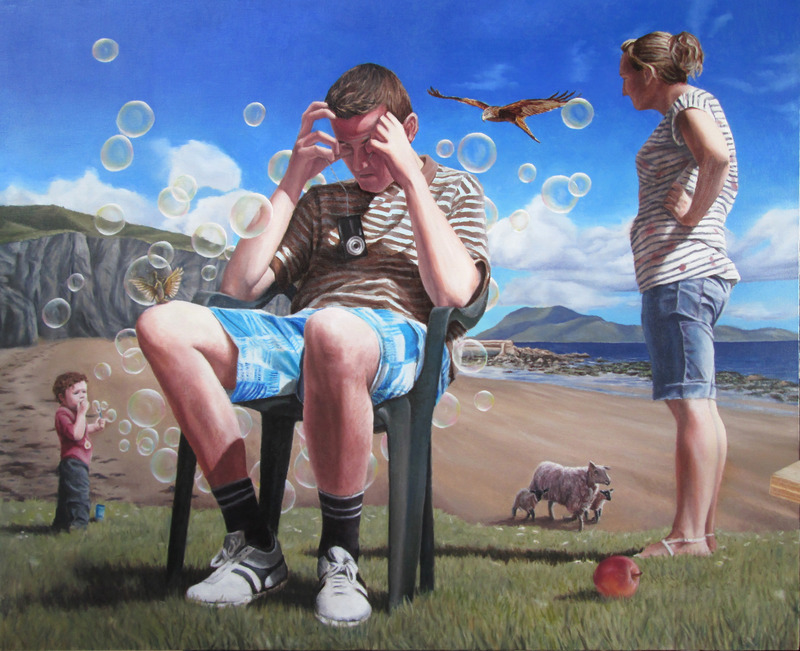 The ambiguous narrative of the painting alludes to fear and excitement of making that first big decision of whom you wish to become, to leave the comfort of parental guidance and navigate the currents of the big wide world. 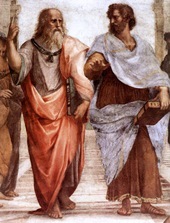 The reference in the title to the Greek philosophers is a very simplified view of their opposing out looks, best summarised in Raphael’s painting the school of Athens (detail right), where Plato (the older man) is pointing up to the heavens symbolising his believe in a more perfect reality outside of our own and Aristotle gestures toward the ground emphasis the real and observable world. In the same spirit of variance I have included a seed eater attempting flight and the cruising bird of prey , the earth bound apple and the weightless bubble. Between solid earth and expansive sky, rolling waves and shifting sands, three people ponder.